Archive of 2007 PNC Info. 12/22/07 - The January 2008 issue of Coil Line has been posted and available for those who have opted to receive the electronic version. The URL will be sent out shortly. The print version should be in the mail about December 28th. 12/19/07 - Scans of the Avery Dennison coils of 100 P/V and V/P die cuts have been posted. The Valley/Peak stamps have Bell tops. 12/17/07 - Scans have been posted and the data has been updated on the 41� denominated Flag coils from Ashton Potter and both the Avery Dennison coils of 100 and 10k. 12/16/07 - PNC3 auctioneer Joe Sedivy has issued a call for auction lots for the next club auction. The deadline for submission of lots is January 19, 2008. Click here to go to the consignment form. � 41� Flag PSA coil of 100, SSP, S1111, interval is 31, I'll look for the P/V etc thing but these are a little high so I am having trouble. � 1� Tiffany Lamp, gummed coil of 3000, middle pink back numbers, 4 digit, #/# every 70. I only have one coil but can probably get more. � (5�) Seacoast (27), PSA 10K coil, P9999, 4 digit top black numbers, first digit starts in between stamps, #/# every 270, centering looks good. 12/9/07 - Several sources have confirmed the newest plate combination, P9999, on the (5�) nondenominated Sea Coast stamp from Ashton Potter. Mike Lipson notes that his supply has black back numbers. According to the 2008 Scott Specialized Catalogue, number 3612a has been assigned to the 5� Toleware imperf pair of stamps. 12/3/07 - Scott Publishing Company has assigned the following catalog numbers: 4186 to the 41� Flag coil stamp, serpentine die cut 9� vertical, with 'USPS' microprinted on the right side of the flagpole (Ashton-Potter printing), and 4187 to the 41� Flag coil stamp, serpentine die cut 11 vertical, with 'USPS' microprinted on the left side of the flagpole (Sennett printing). 12/2/07 - The link to the August 2001 Coil Line got corrupted and has been fixed. Thanks to Mark Mangum for spotting it. 11/30/07 - The December 2004 issue of Coil Line is now online in the 'Reference' section. The December 2007 issue of Coil Line went in the mail Wednesday, November 28th. 11/21/07 - The December 2007 issue of Coil Line has been posted and available for those who have opted to receive the electronic version. The URL will be sent out shortly. Ray Gittings found an error on the die cut listings on the (41�) Ashton Potter printing of the Flag on Pole stamp. It has only been reported as Valley/Peak. 11/18/07 - Todd L. Johnson sent the scans shown here and a note that said: I purchased an assortment of clipped stamps at Gettypex in Gettysburg, PA in October. As I was finally able to go through them recently, I came across a previously unreported plate number [#V21113] for the Avery Dennison Atlas Statue (Scott #3770). I looked at the PNC data on the web site and in the Coil Line and can find no reference to this number. It appears that Todd has found a previously unreported plate combination on the (10c) Atlas. All of the affected pages have been updated. 11/14/07 - The results of our PNC3 auction #37 which ended October 20, 2007 are now posted online. All the auction information can be accessed by using the 'Membership' button, or by clicking here for the auction results. Thanks to Auctioneer Joe Sedivy for another successful auction. 11/10/07 - Donna Rajotte in Providence and Renate Fearonce in Tucson both have the Ashton Potter 41� Flag in coils of 100. 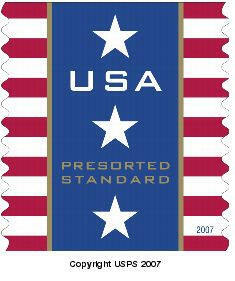 11/9/07 - Below are examples, reported by Mike Lipson on the US Stamps Discussion Group, of Seam Lines from Sennett Security Products and Ashton Potter on the 41� Flag on Pole coil stamps. Click on the scans to see strips of 5. 11/8/07 - Here are the order numbers for the 41� denominated Flag coils of 100 from all three printers from the 'Cave' in Kansas City: Ashton Potter - 784840, Avery Dennison - 784841, Sennett Security Products - 784842. These numbers have been posted on the web site for quite some time on the individual data pages. 11/6/07 - I've had several reports that the 41� denominated Flag coils of 100 from all three printers are now available from the 'Cave' in Kansas City. 11/1/07 - Lowell Handberg found a typo in the 'Plate Number Coil Checklist - Contingency & Officials' which has been corrected. The November 2004 issue of Coil Line is now online in the 'Reference' section. 10/31/07 - An email received from Steve Esrati notes: "Kansas City has told Al Haake that the Sennett coils of 100 of the 41� Flag will not be released until the middle of December." 10/26/07 - Brian and Cory Snippen sent a note that the November issue of Coil Line went in the mail today by bulk rate. They were able to put a PNC single on all the letters as an added bonus. They also commented that the issue looks fantastic with the front page in color. Both Donna Rajotte in Providence and Renate Fearonce in Tucson have the Avery Dennison 41� Flag in large coils. Renate has the PSA 10k coil, V11111, middle aqua back numbers, 5 digits, back number is in position 2 or 1L, and Donna has the PSA coil of 3k, plate number V11111 every 10 stamps, aqua 5 digit middle back numbers every 10 stamps, position 2 only. USPS item number-785800. Ron Blanks reports that he received a tagged copy of the (5c) Sea Coast as early as July 30, 2004. The data page has been updated to reflect that find, which resulted in the Scott listing of 3785b. Rob Washburn announces that his latest pricelist of pnc commercial covers and other mint pncs & U.S. stamps will be available on 10/31/07. Anyone wanting one should send a 58 cent #10 size SASE to Rob Washburn, P.O. Box 840, Skowhegan, ME 04976. 10/25/07 - Dan Farrar, the PNC3 Secretary sent in a scan of a cover he received from the Disabled American Veterans which shows them using the 4� Chippendale Chair stamps. Click on the scan for a larger view. 10/22/07 - Steve Esrati says in an email to his new issue customers that the 41� Flag coil from Ashton Potter is on the way from his supplier. 10/19/07 - The November 2007 issue of Coil Line has been posted and available for those who have opted to receive the electronic version. The URL will be sent out shortly. 10/1/07 - The October 2004 issue of Coil Line is now online in the 'Reference' section. 9/29/07 - As a result of an inquiry by Ron Archer, and after consulting with several sources, it has been determined that the listing for plate S1111 with Uneven Tagging on the 37� Flag, Scott # 3632Ae is in error and that plate combination does not exist with uneven tagging. 9/24/07 - Bob Rabinowitz reported over the weekend on the U.S. Stamps Group on Yahoo that plate combination P8888 has been found on the Self-Adhesive (5�) Sea Coast, which is shown on the right. 9/21/07 - Marty Hatton, the philatelic clerk at The Stamp Shoppe in Minneapolis, Minnesota updated the information on his office and noted that the St. Paul Pioneer Postal Emporium is closed. 9/20/07 - There was a problem, spotted by Frank Covey, with the 4� Chippendale Chair link on the detail page list. It has been corrected. (10�) Patriotic Banner, PSA coil of 10k, Avery printing, plate number V111 every 10 stamps, aqua 5 digit back numbers every 10 stamps. Back number is three to the left of the plate number (position -1). USPS item number-784700. 41� Flag, PSA coil of 100, plate number V11111 every 11 stamps. USPS item number-784800. 41� Flag, PSA coil of 3k, plate number V11111 every 10 stamps, aqua 5 digit back numbers every 10 stamps. Position 1 only. USPS item number-784900. 9/15/07 - Auction Director Joe Sedivy has the lots for PNC3 Auction #37 posted. The auction ends October 20 and you must be a member to bid. Click for a 'Works' or a 'Word' file and here for the bid form, or go to the 'Membership' tab for this or past auctions and/or to join the club. Joe asks that you please include your email on your bids. Marty Frankevicz, New Issues Editor of Scott Publishing said that "Plate number strips, like plate blocks are not lettered items. The unlettered PNC listing for the flower coils will be for a strip of 11, just like the Eagles (Scott #3801a and 3801bc) a few years ago. The strip of 11 will have two orange Gerbera daisy stamps at the ends." Numbers have been reserved (probably 4186 and 4187) for two additional flag stamps that were scheduled for release but have not yet been received. 9/6/07 - Alan Thomson posted the following on the US Stamps Group on Yahoo regarding Scott #3632A, the 37� Flag Waving coil stamp. "Those who are technically oriented may find this interesting. A collector with some pretty sophisticated equipment has found that the orange glow of the flag stripes under LWUV is not due to fluorescent red ink. Rather it is due to a "show through" of fluorescent yellow ink which is the underlying color in the stripes. I hope to get the note below the 3632Ae entry in the Scott Specialized Catalogue changed to reflect this. It's too late for this year as the 2008 edition has already gone to the printer. The same yellow ink was used on 3632A plate numbers that do not display the orange glow, but the heavy application of the red ink blocks the effect of the yellow fluorescence." 8/31/07 - The September 2004 issue of Coil Line is now online in the 'Reference' section. 8/30/07 - Renate Fearonce in Tucson is back from vacation and has the 41� American Flag PSA coil of 3,000, with aqua middle back numbers, position 2, every 10. 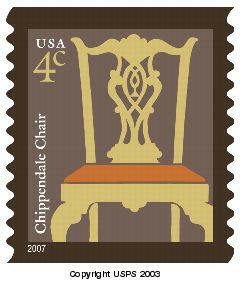 8/29/07 - Frank Covey pointed out that the 4� Chippendale Chair stamp did not have listing under the 2007 New Issues. That has been corrected. 8/28/07 - The club is now in a position to sell the First Day Ceremony Programs from the 41� Beautiful Blooms stamps issued at the APS StampShow in Portland, Oregon on August 10th. The sale of these programs will help defray some of our upfront costs in co-sponsoring the first day ceremony, and will make a great souvenir of the first PNC3 sponsored first day ceremony. Click here to be sent to the order page. Note that one item is sold out and others are in very short supply. The quantities remaining will be updated as necessary. 8/27/07 - According to a report posted by Richard Beecher on the Virtual Stamp Club, the following list shows the availability of 41� American Flag items from Stamp Fulfillment Services in Kansas City. 8/25/07 - Al Haake reports through Steve Esrati that all of the 41� denominated flags that he has, both V/P and P/V, are on high bright paper. A reader with the screen name Fnemeth caught a typo in an article posted a couple of days ago. 8/23/07 - Another seam line has turned up on the 41� Beautiful Blooms coil. This one is black and located in the same area as the previously reported red seam line. Steve Esrati forwarded a report from Jim Kloetzel, Editor of the Scott Catalogues, that the catalog will number the Beautiful Blooms starting with the Iris stamp. 8/22/07 - Gerold Vongerichten sent a scan of the black seam line on the 41� Beautiful Blooms plate number stamp. Click here for a direct link to the scan. Will these stamps be Plate Number Coils or Not? 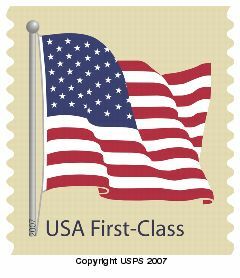 The United States Postal Service announced on Thursday, August 9, 2007 at a media briefing held at the APS StampShow in Portland, Oregon that they planned to issue a series of 60 Commemorative Flags in coil format in a program called "Flags of Our Nation". 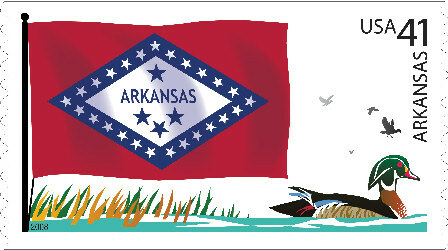 The flags will be issued in alphabetical order, in coils of 50 stamps, probably starting in June of 2008. There will be 10 different designs on each coil and each flag will repeat five times. The first ten stamps are pictured here. The total series, consisting of 50 State Flags, four American Flags, five territories and the District of Columbia, will be issued over a three year period, with two coils of 50 being issued each year. The coils probably will be attached at the sides, according to the preliminary art work. Click here to see larger images. 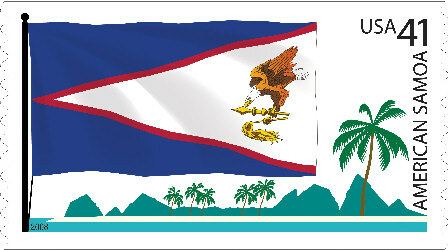 The second set of 10 flags will be for the District of Columbia, Florida, Georgia, Guam, Hawaii, Idaho, Illinois, Indiana, Iowa and Kansas. There is no word at this time from the Postal Service if the coils will contain plate numbers. 8/21/07 - The September 2007 issue of Coil Line has been posted and available for those who have opted to receive the electronic version. The URL will be sent out shortly. Attached to the September issue of Coil Line is a pre-addressed letter to David Failor, Executive Director of Stamp Services, United States Postal Service. It concerns the USPS decision not to change plate numbers on postage stamps when there is a printing plate change. We are asking everyone to mail a copy of the letter with your information and comments to David Failor. This may be our last chance to get a change in policy. You can also print out a copy of the mailer by clicking here. 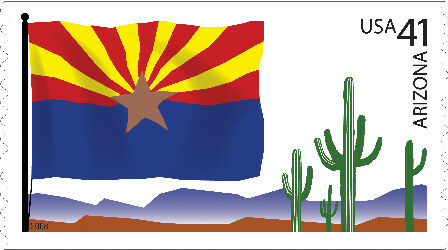 Renate Fearonce in Tucson says that she will be away from the office from August 22nd until the 30th. Donna Rajotte in Providence, according to her website, is away until the 27th. The picture on the right is a portion of the front cover of the Beautiful Blooms First Day Ceremony Program. The ceremony was jointly co-sponsored by PNC3 and The American Philatelic Society. We will be selling ceremony programs as soon as the web page is complete. 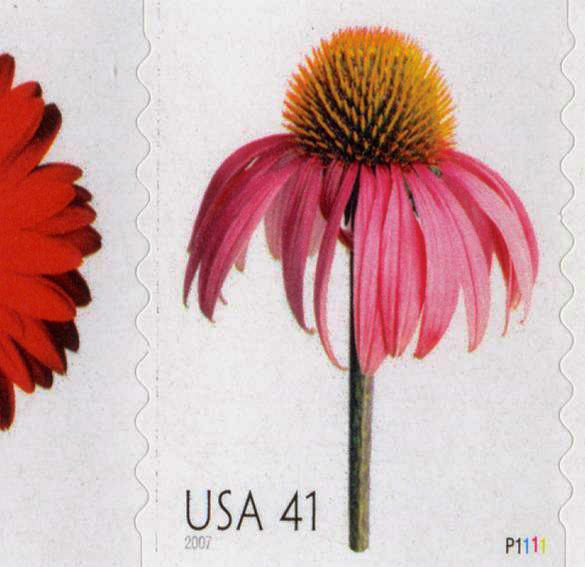 8/17/07 - Scans have been posted of the 41� Beautiful Blooms stamps including the red seam line. Other data on the page has been updated. A black seam line is also known on the left side of the plate numbered stamp. The August 27th issue of Linn's Stamp News carries a story by Jay Bigalke on the discovery of an imperforate coil of the Sennett American Flag non-denominated coil of 100. 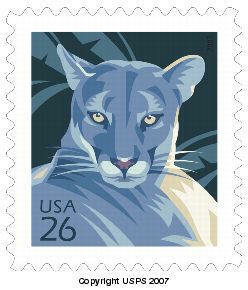 Linn's issue of August 20th reported a similar error on the 26� Florida Panther stamp. Steve Esrati pointed this out. It was in the Postal Bulletin yesterday. 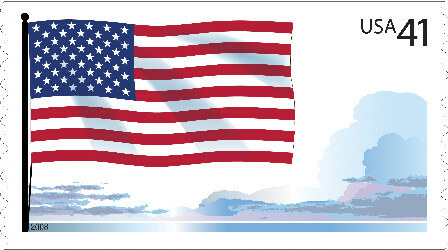 The article �Stamp Announcement 07-33: American Flag (2007)� in Postal Bulletin 22211 (7-19-07, pages 19�24) states that the PSA coil of 100 (Item 784800) will be available in three versions printed by three suppliers. Initial stock of Item 784800 will be supplied only by Avery Dennison. Sennett Security Product and Ashton Potter versions of this item are not presently available. Both versions will be available at a later date. Renate Fearonce in Tucson says that she has the 41� Beautiful Blooms and some of the 41� denominated flags. Renate also notes that there are efforts at the regional level to close down her office (again). She asks that you send a letter to the district manager on her behalf. Click on the link for details. Renate also sent her new inventory. Donna Rajotte in Providence wrote to say that she has the 41� Beautiful Blooms. 8/15/07 - The next annual PNC3 membership meeting will be held August 16, 2008 in Hartford, Connecticut, during StampShow 2008. The Avery Patriotic Banner stamps found at StampShow were from coils of 3000 and had middle 5 digit back numbers at position 2L. 8/13/07 - A red seam line was found on the stamp to the left of the plate numbered stamp by Gene Trinks while stripping out the 41� Beautiful Blooms stamps at StampShow in Portland. Seam lines only appeared on about 20% of the coils. The plate number is on the Echinaces (purple coneflower) stamp. Scans to follow. The data page has been updated. 8/6/07 - Scott Publishing Company today assigned the following catalog numbers: 3761 to the 4� Chippendale Chair, 4157 to the Avery Patriotic Banner and 4158 to the Sennett Patriotic Banner. All of the affected pages have been updated. 8/3/07 - One week to go. Next week on Friday, August 10th, PNC3 will be co-hosting the 41� Beautiful Blooms First Day of Issue Ceremony along with the American Philatelic Society at 11 a.m. in rooms B113-115 of the Portland, Oregon convention center, during StampShow 2007. The following day, at nine in the morning, in room C123, PNC3 will hold a board meeting. All members are invited to sit in. After lunch, at 1 p.m., we will have our annual membership meeting in the same room. We have the room reserved from 1 till 3. There should be time for buying and selling. PNC3 will be staffing a booth on the convention floor, where we will have ceremony programs for sale, applications for membership for anyone wishing to join the club, a copy of the PNC3 catalog, handouts including recent issues of Coil Line, and a PNC power point presentation running during show hours. The PNC3 catalog committee will be meeting sometime Friday or Saturday evening, at a time and place to be determined. 8/2/07 - Scans have been posted on the Avery Patriotic Banner stamp and the Chippendale Chair, plus some technical data has been updated. 7/31/07 - The August 2004 issue of Coil Line is now online in the 'Reference' section. 7/28/07 - What follows is an excerpt from an email from Julia Lopez, the Studio Manager for Mark Laita Photography. Mark Laita, of Culver City, CA, was the photographer of the Beautiful Blooms stamps. The following are the names of all ten flowers that are depicted on the stamps. The flowers are listed in order as they appear in the picture below. 7/25/07 - Renate Fearonce in Tucson says that she finally received the 4� chair. Details: 4� Chippendale Chair (14), gummed 10k coil, top, bottom, and low middle pink back numbers, 5 digits, all three coils are odd (position 2/4) or 1L and 1R. Steve Esrati reports that he is shipping # on # strips with the back number on the top. The 4� Chippendale Chair data page has been updated with this new information. 7/22/07 - Scans have been posted on the data pages for the 41� Official Mail coil and the Sennett 10k version of the (10�) nondenominated Patriotic Banner stamps. 7/21/07 - Joe Sedivy is now accepting lots for the next PNC3 auction. The deadline is September 1st to have the lots to Joe. Click here for a consignment form. In the Postal Bulletin this week, USPS announced that the 41� denominated American Flag would be issued August 15th in coils of 100, 3000 and 10,000. The coils of 100 will be produced by Ashton Potter, Sennett Security and Avery Dennison. Avery will do the coils of 3k and 10k. Tentative data for all formats has been posted. Thanks to David Beattie for the heads-up. 7/19/07 - The August 2007 issue of Coil Line has been posted and available for those who have opted to receive the electronic version. The URL will be sent out shortly. 7/11/07 - Updated - Scott Publishing Company has assigned catalog number O162 to the 41� Official Mail coil. Scott also changed the catalog number of the 1� Tiffany Lamp coil to 3758 from 3757.
designs have been posted. Click on the image below for a larger view. 7/5/07 - Donna Rajotte in Providence wrote to say that she has the Sennett 10k version of the (10�) nondenominated Patriotic Banner stamps with top, middle and bottom back numbers. 270 stamps are needed for all positions. Donna also notes that the Avery version will not be distributed until late July. 7/1/07 - Technical details from the Postal Bulletin for both the Avery Dennison version (3k and 10k) and the Sennett Security Products version (10k) of the 10� nondenominated Patriotic Banner stamps have been posted. Also posted are the details for the 4� Chippendale Chair Water Activated coil of 10,000 to be issued July 19th. 6/30/07 - The July 2004 issue of Coil Line is now online in the 'Reference' section. 6/27/07 - A phone call today to Stamp Fulfillment Services confirmed that the 41� Official Mail Stamp can be purchased as a strip of 25. The order number is 785430. 6/21/07 - The July 2007 issue of Coil Line has been posted and available for those who have opted to receive the electronic version. The URL will be sent out shortly. 6/19/07 - David J. Merkler, from Valrico, Florida, has been appointed to chair the Ethics Committee. Thanks to David for his interest in the club. Contact information is on the Officers page. 6/16/07 - Bruce Menia called my attention to a lot on Ebay featuring the Avery Dennison stamp shown on the right. The lot number is 270132619658, with the auction ending in 5 days. Final Price: - $56.00. 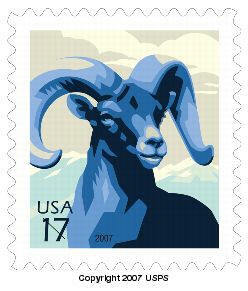 4140 - 17� Bighorn Sheep, self-adhesive coil stamp, serpentine die cut 11 vert. 4141 - 26� Florida Panther, self-adhesive coil stamp, serpentine die cut 11 vert. 6/6/07 - Renate Fearonce in Tucson wrote to send her new inventory list and to announce that she has the AP Flag PSA coil, 17� Bighorn Sheep coil, panes of the Panther and Bighorn Sheep and the new 69� and 90�, plus the Star Wars and Jamestown. 6/4/07 - Another Patriotic Banner stamp early usage has shown up in the mail. Roland Austin�in Stillwater, Oklahoma sent the example pictured below with the explanation, "This was mailed to my neighbor who saves his mail for me to examine for postal history.� Alas, it was delivered on June 1 during the afternoon period in Stillwater, OK,�when we received 6.5 inches of rain�in four hours, so it has some water damage, especially at the bottom bar coding.� It picked up a cancel when it arrived in Oklahoma City before being delivered to Stillwater." 6/1/07 - The June 2004 issue of Coil Line is now online in the 'Reference' section. 5/31/07 - Walter Figel, Jr., a relatively recent PNC3 member from Castle Rock, Colorado, has been appointed to chair the By-Laws Committee. Thanks to Walter for his interest in the club. Contact information is on the Officers page. 5/29/07 - Robert E. Thompson, a PNC3 Life Member from Houston, Texas, has been appointed to fill the Membership Committee Chairmanship created by the resignation, for personal and family reasons, of Janet Gillis. Thanks to Janet for her hard work the past several years and welcome to Robert. Contact information is on the Officers page. 5/24/07 - To the right is a black & white copy of the Patriotic Banner stamp early usage that Gil Mattox reported a few days ago. The actual cover is blue. A larger version can been seen by clicking on the scan. Donna Rajotte in Providence wrote to say that she has the 17� Big Horn Sheep coil of 100 with plate S11111111 every 31 stamps. Donna says that they all appear to have a peak die-cut at the top and a cobra cut at the bottom.� USPS item number-785700. 5/22/07 - The June 2007 issue of Coil Line has been posted and available for those who have opted to receive the electronic version. The URL will be sent out shortly. 5/21/07 - The latest version of the club membership application is online for those who need copies until we can get printed copies back from the printer. Click here or access the application from the 'PNC Membership' navigation bar. Thanks to Mike Murray for his help in getting the form reworked. 5/19/07 - Gil Mattox, the philatelic clerk in West Covina, California reports that he saw a piece of mail going through his office yesterday franked with the unreleased 'Banner' stamp. It was mailed from the east coast by Blue Cross. 5/18/07 - Steve Esrati reports that "Al Haake has just discovered a major tagging variety on Avery's undenominated 41c coils (of 100). The ones he and I sent out originally showed the difference most under long-wave UV where the flag shines brightly out of the stamp. Under short-wave UV, the flag is still bright. 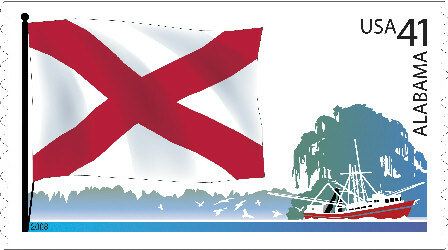 On the new variety, however, the flag no longer stands out and sort of melts into the yellow background under either type of UV." I can report that I have both varieties. It may well be that what Steve is describing is the 'Hi Brite Paper' glowing, but there is a definite difference in the tagging between the two. The non hi brite stamps emit an overall 'greenish' glow under short wave UV, and the white flag stripes appear more as a greenish yellow. The stamps with the 'hi brite' white stripes don't seem to show any tagging. My local post office currently has what Steve is describing as the 'new' variety, and these have the same tagging as the Avery coil of 10,000. The data page has been updated with the new information. 5/14/07 - The new postage rates go into effective today. Check the new USPS navigation bar on the left for a complete run down on the new rates. 5/12/07 - Donna Rajotte in Providence wrote to say that she has the (41�) Flag WAG coil of 100, S1111. USPS item number-785200. Donna says that they seem to be exactly the same as the rolls of 3k and 10k, except there are no back numbers. Donna also has the 26� Florida Panther, PSA coil of 100, plate number S1111 every 31 stamps. The coils she has all seem to have a very small valley at the top and a cobra bottom. 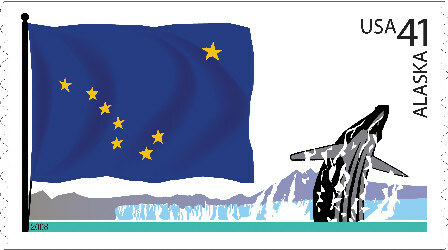 The 2007 date is in the upper right hand corner of the design. USPS item number-785500. 5/10/07 - Renate Fearonce in Tucson wrote to say that she has several of the new (41�) American Flag and the 26� Florida Panther. 5/2/07- Technical details have been posted for the 26� Florida Panther coil of 100 to be issued May 12, 2007, and the 17� Bighorn Sheep coil of 100 to be issued May 21, 2007. Both stamps will be printed by Banknote Corporation of America (BCA) for Sennett Security Products (SSP). 4/30/07 - The May 2004 issue of Coil Line is now online in the 'Reference' section. Donna Rajotte in Providence wrote to say that she now has the Sennett Security nondenominated, water activated, 41� American Flag coil of 10,000. Donna says that it appears to be the same as the 3k coil, except that the back numbers are 5 digits, and she has top, middle and bottom. The plate number is every 31 stamps. The back number spacing is every 10 stamps resulting in a 310 stamp strip for all positions, including a # on #. The following are order numbers for the stamps listed below from Stamp Fulfillment Services (SFS) at Kansas City. All First Day Covers are priced at 79� and the order number 784461 will generate a random Self Adhesive stamp. 4/26/07 - Donna Rajotte in Providence wrote to say that she now has the Sennett Security nondenominated, water activated, 41� American Flag coil of 10,000. Donna says that it appears to be the same as the 3k coil, except that the back numbers are 5 digits, and she has top, middle and bottom. The plate number is every 31 stamps. The back number spacing is every 10 stamps resulting in a 310 stamp strip for all positions, including a # on #. 4/25/07 - A reminder that there will be a regional PNC3 meeting this coming Saturday at the Plymouth, Michigan stamp show at 11:30 am. 4/23/07 - A new navigation bar has been added to the stack on the left. It deals with the USPS and provides a quick access to matters postal. Let me know if you have a link that you think needs to be there. 4/22/07 - The Patriotic Banner presorted standard coil stamp of 10,000 will be issued July 4, 2007 in Washington, DC without a first day ceremony. The value will probably be 10�. 4/20/07 - The May 2007 issue of Coil Line is now posted for those who have the electronic delivery option. The URL will be sent out shortly. Nine of the 14 pages are in color. This option is available for anyone worldwide for yearly dues of only $12.00, after a one time initiation fee of $2.00. Rick Burdsall caught a typo on the EKU on the 1� Kestrel data page. 4/14/07 - Renate Fearonce in Tucson wrote to say that she has several of the new items issued April 12. 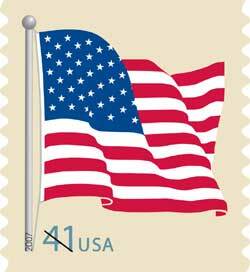 The technical details from the Postal Bulletin for the nondenominated 41� Flag stamps have been posted. All data should be considered tentative as I still do not have the actual stamps. Click on the links in the April 5 item below. 4/13/07 - The results of our PNC3 auction #36 which ended March 24, 2007 are now posted online. All the auction information can be accessed by using the 'Membership' button, or by clicking here. Thanks to Auctioneer Joe Sedivy for another successful auction. ◘ 4� Chippendale Chair,�gummed�coil of 10,000 in July. ◘ 17� Bighorn Sheep,�PSA�coil of 100, May 21. ◘ 26� Florida Panther,�PSA�coil of 100, May 12. Coils from both Avery Dennison and Sennett Security. The Postal Bulletin may be in error on the Florida Panther announcement. Time will tell. ◘ 41� Official Mail,�gummed�coil of 100 in July. ◘ 41� Beautiful Blooms,�PSA�coil of 100, August 10. 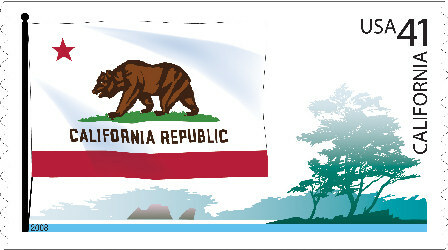 ◘ Patriotic Banner, Standard Presort in a�gummed coil of 10,000 in July. Donna Rajotte in Providence notes that she has many of the nondenominated 41� Flag stamps, plus some of the Forever stamps. 4/9/07 - Scott of TBR Stamps noticed that the Scott Catalog numbers were interchanged on the 34� Statue of Liberty coil with the British paper. 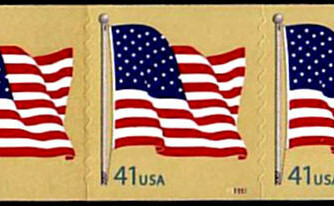 4/5/07 - The United States Postal Service updated the information on the nondenominated 41� Flag stamps to be issued April 12, 2007. Below is a complete list of the new stamps. Click here for a page with the technical data, from the Postal Bulletin, on all the stamps. The Sennett Security stamps will be printed by Banknote Corporation of America. The Ashton Potter stamps will have "USPS" micro-printed on them. 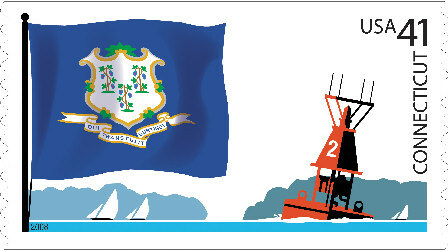 The 41� denominated Flag stamps, pictured on the right, will be issued in August. More details as they are announced. 4/1/07 - The April 2004 issue of Coil Line is now online in the 'Reference' section. 3/29/07 - The Postal Service� will issue a nondenominated definitive, American Flag (2007) stamp on April 12, 2007, in Washington, DC. 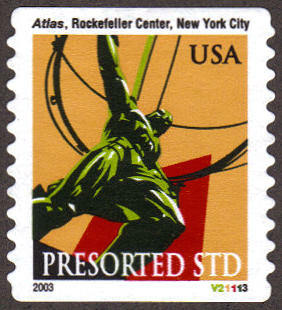 The stamp was designed by Richard Sheaff of Scottsdale, Arizona. 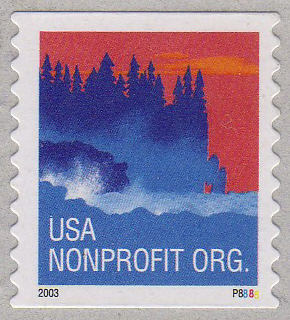 The stamp depicts an American flag waving on a flagpole against a tan background. 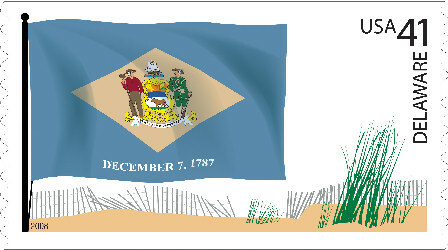 The design of the flag was adapted from an undated postcard in the ephemera collection of art director and designer Richard Sheaff of Scottsdale, Arizona. Pressure-sensitive adhesive (PSA) pane of 20 (Item 02700). Water-activated gum (WAG) pane of 100 (Item 106400). PSA coil of 100 (Item 784400). WAG coil of 3,000 (Item 784500). PSA coil of 10,000 (Item 785000). 3/28/07 - The PNC3 Membership Application form has been reworked to include the Electronic Coil Line format. Dues for this option, which is available worldwide, are $12.00 per year after the first year. A $2.00 initiation and processing fee is included in the first year dues structure. PDF Format or HTML Format. 3/25/07 - The 24� Common Buckeye data page has been updated with information and scans showing a second and possibly a third printing with the same plate number combination, V1111. 3/19/07 - The PNC3 Catalog Committee has published the '2006 New Issues' section of the catalog and the '2007' PNC ID Lists. They have been mailed to members who ordered before March 9th. Several previously issued items are still available (but in very short supply). These include the '2005 New Issues' in color, '2006 Values List', the 'Illustrated Glossary', the 'Avery Die Cuts Comparison', and the two permanent catalog sections dealing with the '32� Flag Over Porch' and the '37� Flag Waving'. A list of all catalog items is posted on the web site. "PNC3 Catalog of Plate Number Coils". The information can also be found by using the 'Reference' section on the left. 3/8/07 - Rate Change Stamps - Bob Rabinowitz writes, "I've had some input on the Rate Change stamps. They will have a U.S. Flag and say first class on them. The background will be tannish. Sheet stamps have already been distributed. There will be SA coils of 100 from Ashton-Potter, Sennett, and Avery Dennison but most offices will not receive all three. There will also be gummed large coils. There will be vending and presumably other booklets as well. My guess is that they will be put on sale during the 3rd week in April. I've not heard anything about the large self-adhesive coils of 3,000 and 10,000." 2/28/07 - The March 2004 issue of Coil Line is now online in the 'Reference' section. 2/26/07 - Steve Unkrich sent a scan of the core label from his find of the Eagle Linerless Test Coil, Scott # TD123. This may be unique as only one coil has been reported. See the scan on the Test Coil page. 2/25/07 - Auction Director Joe Sedivy wrote to point out that there is an error in the listings for the next auction. Lot #225 is listed as Scott #2128A and it is really 2128 the collector edition, not the precanceled one. The correction has been made in the online listings. Renate Fearonce in Tucson is on vacation until March 6th. 2/21/07 - Auction Director Joe Sedivy has the lots for PNC3 Auction #36 posted. The auction ends March 24 and you must be a member to bid. Click for a 'Works' or a 'Word' file and here for the bid form, or go to the 'Membership' tab for this or past auctions and/or to join the club. Joe asks that you please include your email on your bids. 2/19/07 - The Test Coil page has been updated with Scott numbers and the addition of a new test coil, Scott # TD135, that was listed in the 2006 Scott Catalogue but not pictured. Thanks to Alan Thomson for the information. 2/16/07 - John Cropper announced today that our PNC3 message board now has a working RSS Feed, for those with RSS readers. This will enable you to view posts in real-time (if you leave your computer on and connected to the internet 24/7). Click on the link above to view RSS data in IE 7, Netscape 8, Firefox 1.5x (with RSS plug-in) or later, or right-click on the link above and select COPY LINK/COPY SHORTCUT and paste the URL into your RSS reader, or Outlook 2007 (or later) to get the live feeds. 2/13/07 - Rob Washburn would like to announce that his latest pnc covers pricelist will be available on 2/19. Anyone wanting one should send him a #10 size 63 cent SASE. Anyone purchasing from his last pricelist #42 does need not send a SASE as�the new pricelist�will be sent to them automatically. Rob Washburn, P.O. Box 840, Skowhegan, ME 04976. 2/10/07 - Renate.Fearonce in Tucson wrote to say that she found what may be a new printing of the 24� Common Buckeye. "The 24 Buckeye coils arrived and they are package different than previously. These are in a plastic tray and individually shrink wrapped, not in the bubble pack. They still have the paper wrapped around them but this time the text says �Mfg by AD�. In looking at the stamps the only visible difference to me is that the stamp name, �Common Butterfly� is a darker thicker font. Plate number is still V1111 and the perfs seem the same. The date also looks darker." Renate also sent her current inventory list. Shrink warped instead of bubble pack. Black printing appears darker. Under 3X magnifying glass confirms this. Under 30X magnification I see the black #1 in the plate number as thicker and darker. More dots or circle dots making up the number than the older strips I'm using to compare with, for sure. Conclusion: I believe we have a second printing here, with different something. I'll need help from the pro's on this." 2/6/07 - This is a reminder of the regional PNC3 meeting that will be held Saturday, February 10 at noon during the APS AmeriStamp Expo in Riverside, California. I will be there and hope to meet many of our members. 2/4/07 - Joe Sedivy, PNC3 Auctioneer, notes that in the upcoming auction, a previously unreported imperf 37� Flag coil strip with plate number 2222 will be included. The new number has been added to the affected data pages. 2/2/07 - Howard Levine reminded me that the Imperforate 5� Toleware stamps used on a DAV reply envelope had not been included in the web site. That has been corrected. The cover was reported by Dan Farrar and pictured in the August 2006 Coil Line and recently featured in Linn's Stamp News. Scott catalog editor, James Kloetzel, notes that it will receive a major error listing in the 2008 catalog. 2/1/07 - New developments have surfaced in regard to the Postal Service policy on plate numbers. A four way conference call was held yesterday with David Failor and leaders of major stamp collecting groups to discuss the situation. Participating, along with David, were Janet Klug, President of the American Philatelic Society, Roger Brody, President of the United States Stamp Society and Wade Saadi, President of the US Philatelic Classics Society. Click here and then scroll to the bottom for more information. 1/31/07 - The February 2004 issue of Coil Line is now online in the 'Reference' section. 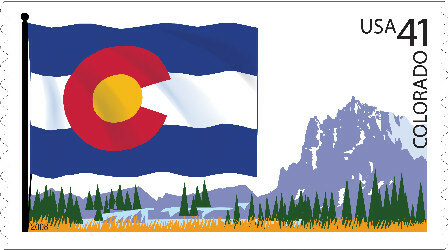 1/30/07 - A comparison page for the 33� City Flag coil stamp has been posted. It shows the difference between the two building types and the date differences. Click here for the comparison page. 1/29/07 - David Failor replies - Click here for a reply from David Failor to requests to change the Postal Service policy on plate numbers. 1/20/07 - The February 2007 issue of Coil Line is online for those members who opted to receive the electronic version. 1/19/07 - Today, just a little over a week shy of a year since the site counter hit 200,000, we surpassed the 250 thousand visitor mark. Thanks to everyone for your support over the years. 1/13/07 - Dan Kauffman, the club Historian and 'PN Seer' cartoonist, sent in a photo. Contact information for Dan, and a photo, is on the Officers page in the 'PNC3 Membership' section. 1/11/07 - The Coil Line Index project is completed and online. All years from 1988 through 2006 are indexed in acrobat format and searchable. 1/4/07 - A Coil Line Index for 1988, which was previously not indexed, has been posted, so that now all years through 2004 are indexed in acrobat format and searchable. 1/2/07 - Don't forget to write and send a letter to David Failor concerning the USPS decision to issue all new stamps with only plate 1s. Linn's Stamp News issue dated January 8, 2007, contains an editorial by Michael Schreiber concerning that matter. Jay Bigalke also has an article in the same issue. Both the editorial and the article mention the Plate Number Coil Collectors Club (PNC3). PNC3 Treasurer, Harvey Wales, caught a typo on the 'Classic Links' page. It has been corrected.